The Financial Resource Requirements (FRR) provides an overview of the budget for activities planned by the GPEI to eradicate all remaining polio disease and prepare for the post-eradication era. The budget that underpins the FRR is prepared jointly by the World Health Organization (WHO), UNICEF, Gavi, the Vaccine Alliance and the national governments. The projected timeline for interrupting transmission of the wild poliovirus, based on epidemiological indicators, is 2020 with potential certification in 2023. The GPEI is expected to finalize the new 2019-2023 Strategic Plan by May 2019 at the World Health Assembly. 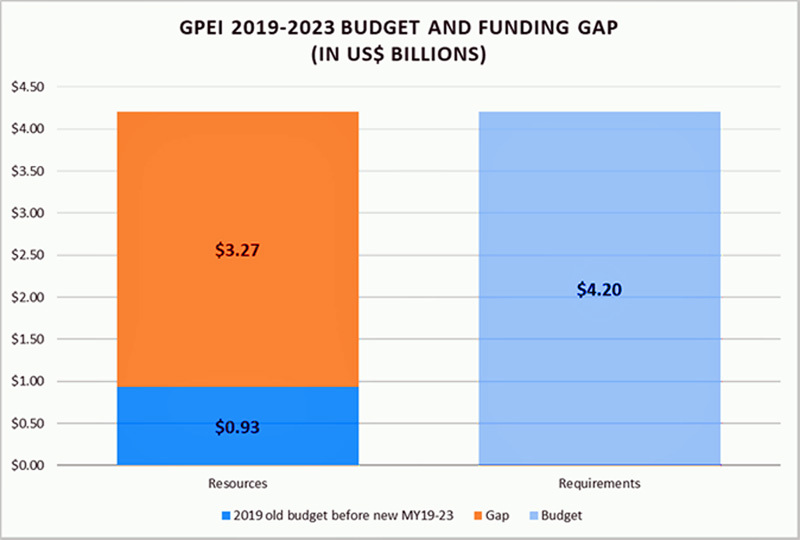 To estimate the cost of sustaining the program through 2023, the GPEI conducted a multi-year budgeting exercise, which concluded that an additional US$ 3.27 billion is needed to fund the US$ 4.2 billion budget. The GPEI has developed a short budget narrative as well as two interactive budget tools: 2019 (annual details) and 2019-2023 (high level details). In addition to the FRRs, the GPEI also provides updated information on available resources from public and private sector donors against the FRRs.